Ready made rings - which should be cheaper from me as I have no shop expenses to pay for. Come and have a look at the amazing catalogues. Buying an Engagement ring is a tricky business. A lot depends on budget, but a lot also has to take into account of what the receiver would like! I have listed a few ideas of how to buy, what to buy and how much to spend. There are also pictures of some of the different rings that I have supplied over the years, perhaps it will get your creative juices flowing. Always remember when buying an engagement ring to consider what kind of wedding ring might work with the engagement ring. If the engagement ring is an awkward shape it might make it difficult to run a plain band next to it. This can cause you lots of problems and extra expense when trying to buy a wedding ring. This lovely 3ct Aquamarine stone is flanked by diamonds completely around the shank of the ring. Also there are 4 diamonds in the top of the claws holding the Aquamarine stone in place. Do be aware though that a design like this can never have the size altered. 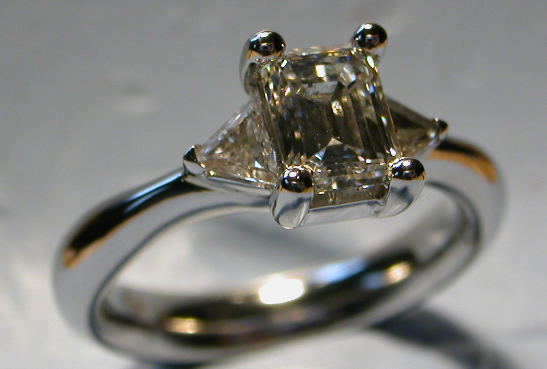 Set in Platinum, this princess cut diamond is the focal point on an 18ct yellow gold shank. The 2 diamonds set in the angled ends of the shank set the centre stone off perfectly. Delicate, yet solid, this ring’s design is timeless. This 3 stone engagement ring made in Platinum could easily be made in 9 or 18ct white or yellow gold. In the case of this particular ring the stones were all set on top of the band making it easy to add a plain band wedding ring when the time came. The stones are emerald cut (centre) and 2 triangle stones (both sides). So, talk to me about your ideas for engagement rings and let me put your dreams into reality.